Stamping Formulas Get color, texture and finish formulas for recreating popular stamped concrete looks. 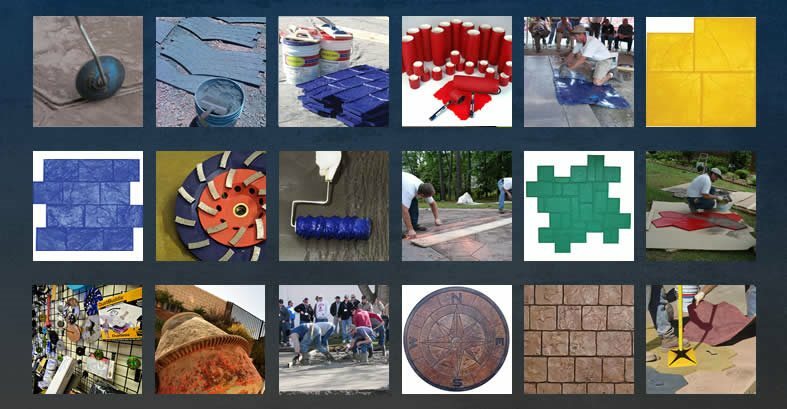 Stamped Concrete Sealers Get tips for choosing the right sealer, applying sealers and more. Concrete stamps are made of polyurethane, a material that is flexible, yet strong. They range in size from 2 to 3 feet, with oversized stamps measuring up to five feet. Specialty stamps are also available and include borders, radial or sun-burst designs, compass roses, medallions and more. Many manufacturers will also create custom stamps based on your specifications. Medallion Stamps Elegant designs by Proline. Easy to color and maintain. Herringbone Used Brick Tool Size is 44" x 27"
HOW LONG HAVE CONCRETE STAMPS BEEN AROUND? Concrete stamping originated on the West Coast way back in the 1950s. If you were to flip through the pages of a decorative concrete history book, you'd probably come across old photos of the first concrete stamps. These stamps were made from cast aluminum and resembled giant cookie cutters with handles attached. Although these early tools were great for imprinting basic brick or stone patterns in fresh concrete, they didn't impart any texture so the results looked unrealistic in comparison with what you can achieve today. Now, most concrete stamps, or stamp mats, are molded from the real materials they mimic, resulting in stunningly authentic textural effects. A single concrete stamp will cost between $50 and $350, while a set of stamps will range between $500 and $3,500. Custom stamps will cost considerably more. Some contractors budget up to $15,000 a year for new stamps, which includes replacing damaged stamps and adding new patterns to their lineup. Learn more about the cost of concrete stamps. Because investing in a full set can be a large expense, you may want to consider renting stamps, especially if the pattern is one you don’t predict reusing for future work. Stamps can be rented for a daily fee from your local concrete supply store. Rental rates can range from $150 to $350 per day depending on the stamp pattern. If you’d rather own your stamps, but still don’t want to pay full price, used stamps are an option. Of course, remember that just like buying a used car without a warranty, you are assuming some risk. Used stamps can be found for sale on sites like Craigslist or Ebay. You can also ask your local concrete supply store if they have any used sets you can buy. In order to successfully complete a project you will need a full set of stamps. A set typically includes 3 or more rigid mats, a flex mat (or floppy) and touch-up skins. Pro tip: Have enough stamps to make a complete pass across the widest part of the slab, plus two more tools for starting the next row. Rigid mats are used for stamping a majority of the concrete. Each rigid mat is color coded so you can tell them apart and make sure you aren’t creating unwanted repetition. Having lots of rigid mats allows for greater pattern variation and a quicker install. Flex mats or floppies are used for stamping sections where the rigid mats won’t fit. These stamps can be bent to ensure the texture is imprinted when working close to walls or other obstacles. Touch-up skins are used to pre-texture the edges of a slab and to help with very tight spots. Sometimes you’ll run into a situation where even a flex mat isn’t sufficient. In these cases use a touch up skin and a chisel to do detail work like grout lines. WHAT STAMPS ARE BEST FOR BEGINNERS? Seamless skins are a great option if you are just getting into stamping. These stamps impart realistic natural stone texture, but do not have a pattern, making them the easiest way to add elegant texture to concrete. Since texture mats don’t have a joint pattern you won’t have to worry about precise alignment. Simply overlap the feathered edges by 6-8 inches as you go. You can texture concrete very quickly and comeback later with a saw to cut in a pattern if you’d like. When you are ready to go beyond seamless patterns, opt for stamps that are frequently requested by your customers. An ashlar slate or flagstone set will probably get a lot of use. HOW LONG DO STAMPS LAST AND HOW SHOULD THEY BE CLEANED AND STORED? Experienced contractors report that high-quality stamps will last for 10 to 15 years when cleaned and stored properly. Proline Concrete Tools, a leading stamp manufacturer, recommends washing your stamps with liquid dish washing soap and a soft brush after every use. They can also be sprayed with silicone to keep them well conditioned. Always store your stamps flat, do not bend or roll them to save space. ARE SPECIAL STAMPS REQUIRED FOR USE WITH OVERLAYS? Stamping old concrete is possible with the use of an overlay. The overlay is poured over the existing concrete and then stamped with the desired pattern. When stamping an overlay, ensure the pattern’s joints are 3/8” or shallower. Learn more about stampable overlays. ARE SPECIAL TOOLS REQUIRED FOR STAMPING VERTICAL SURFACES? The main concern when it comes to vertical stamping tools is weight and size. Typical stamps you would use on a patio or driveway will be too heavy and large to use on a wall. WHAT ACCESSORIES, EQUIPMENT AND MATERIALS ARE REQUIRED FOR STAMPING? A powder that is broadcast and troweled into fresh concrete before stamping to add color, improve durability and produce clear, sharp impressions. These act as bond breakers to prevent stamping mats and skins from sticking to the concrete and impart subtle color that enhances and antiques. A liquid membrane-forming compound that is sprayed onto the concrete after it has hardened and excess release agent has been rinsed off. A tool used for pushing the stamps into the concrete to produce a better imprint. These rollers are great for knocking down any concrete that oozed between stamps. Often used to continue joint lines where a stamp cannot fit. An oversized pair of sandals with a textured sole that are worn over work boots. IS STAMPED CONCRETE A DIY PROJECT? 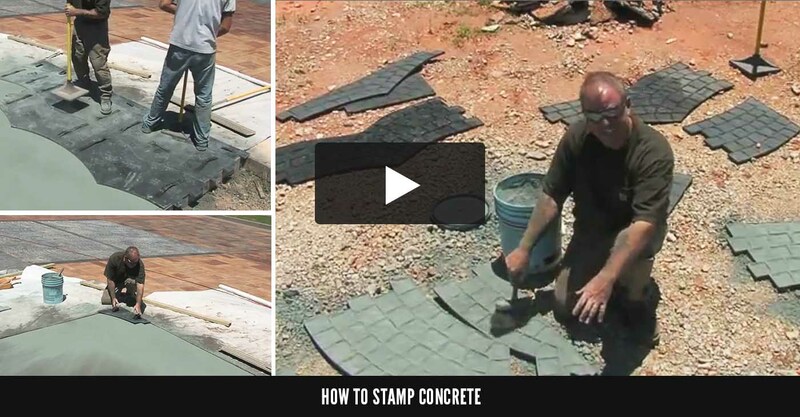 Stamping concrete is harder than most people realize. Learning how to stamp concrete yourself is not something you can do without hands-on experience. The stamping process is labor intensive, requires expensive tools, has to be done in a short window of time and has many variables that will affect the outcome of the final product. 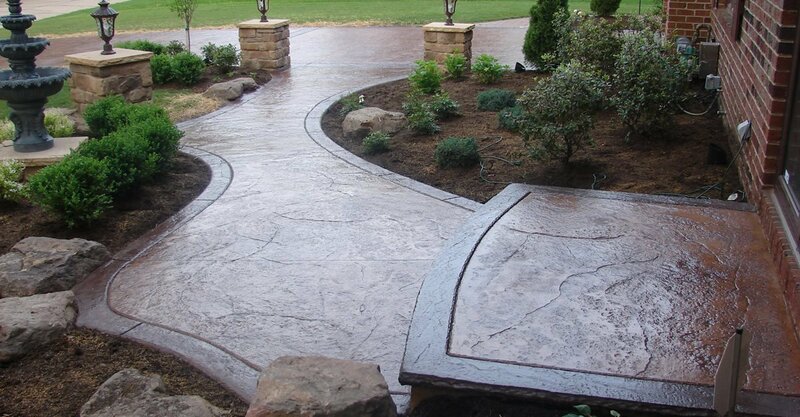 Professional stamping contractors usually bring a crew of at least three workers to complete a stamping project. These workers have learned how to stamp concrete by following the instructions provided with their stamp mats and attending trainings hosted by stamp manufacturers or concrete supply stores. Before using a new set of stamps many of them will practice in a bed of sand so they know what to expect from the pattern. WHEN SHOULD CONCRETE BE STAMPED AND HOW LONG DOES IT TAKE? There is a very short window of time in which concrete can be stamped. The concrete needs to be firm enough to support the weight of the workers doing the stamping, but soft enough to allow the stamp mats to leave a detailed impression. The process has to be done quickly or else you may end up with lighter texturing as the concrete hardens. According to Butterfield Color, it should take about 45 minutes to stamp 8 yards of concrete. Weather also has an impact on the working time for a stamped concrete project. Heat and wind seem to be two of the hardest things to deal with since they speed up the setting time of the concrete. Check the weather and delay the project if it means you will struggle to produce the quality of stamped concrete desired. WHAT TYPE OF MIX IS BEST FOR STAMPED CONCRETE? 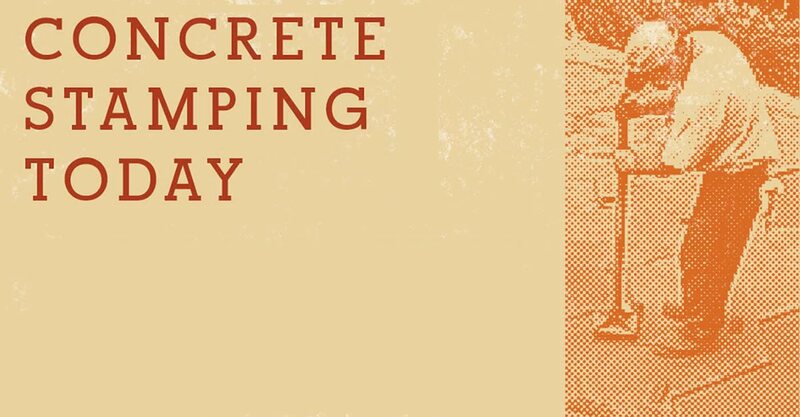 The consistency and makeup of your concrete mix can make or break your stamping work. Many decorative concrete contractors prefer pouring concrete that will be stamped at a lower slump (between 4 and 5 inches). A lower slump can be stamped sooner and prevents oozing between stamps. Veteran stampers also prefer a mix that has more cream at the surface because it results in crisp impression. Furthermore, aggregate of ¾” is ideal because it is large enough to prevent shrinkage problems, but not so large that it interferes with stamping. HOW DO YOU PREVENT STAMPS FROM STICKING TO THE CONCRETE? Using a release agent will prevent your stamps from sticking to the concrete. Powdered release agents are broadcast onto the slab prior to stamping and impart color to the surface. Be careful not to use too much powdered release, as it can interfere with the pattern. Liquid release agents are sprayed either onto the slab or onto the stamps and can be tinted for added color. Some contractors use two colors of powdered release or a powder and a liquid to create accents. HOW DO YOU AVOID A REPETITIVE LOOK? There’s nothing worse than a stamp job with a repetitive pattern. Repetition when stamping with ashlar slate or flagstone mats is a dead giveaway that this isn’t the real deal. Avoid repeating patterns by carefully placing the mats at random—do not repeat the same sequence (i.e. red, yellow, blue, red, yellow blue). Additionally, some stamps can be rotated 45 degrees each time you move them to a new spot on the slab, but this does not work for certain patterns. Some stamp manufacturers offer placement guides to ensure that you end up with plenty of variation. WHEN DO YOU CUT CONTROL JOINTS AND CAN THEY BE HIDDEN OR ELIMINATED? Control joints should be cut the day after stamping. When working with seamless stamps it is easy to work control joints into your pattern of saw cuts, but when working with patterned stamps, this isn’t easy. If your pattern has some straight edges (brick, ashlar, wood, etc. ), do your best to follow the pattern as much as possible. Another option is to incorporate bands or borders into your design to hide the joints. Some contractors have had success reducing or eliminating joints by using steel fibers in their concrete mix.